The Bahraini Grand Prix in Sakhir is a great track. So many chances for passing and excitement. 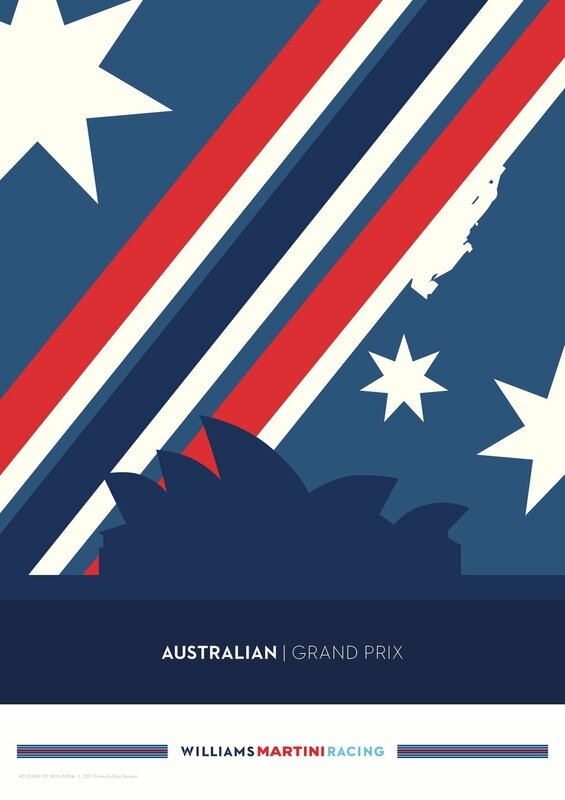 This race should be an early highlight of the season. 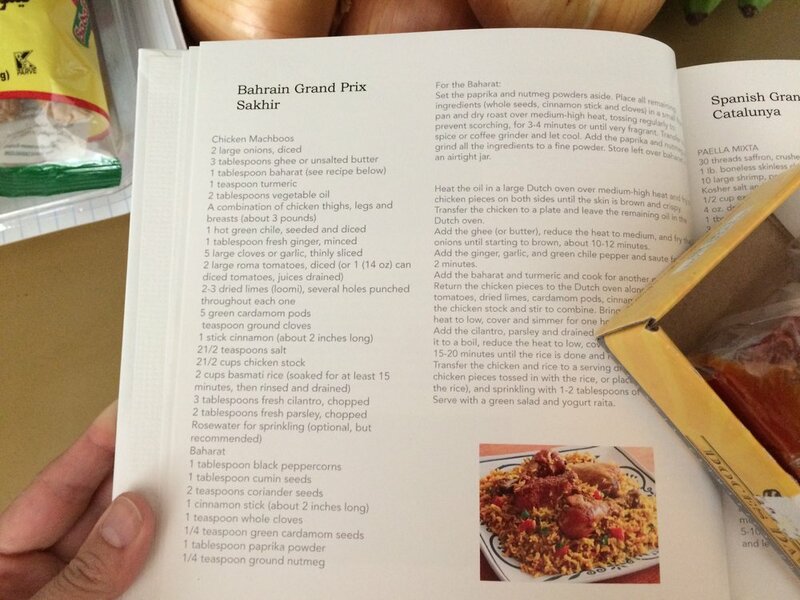 When it comes to picking what to cook for this race, well, Bahrain definitely has A dish: Machboos. 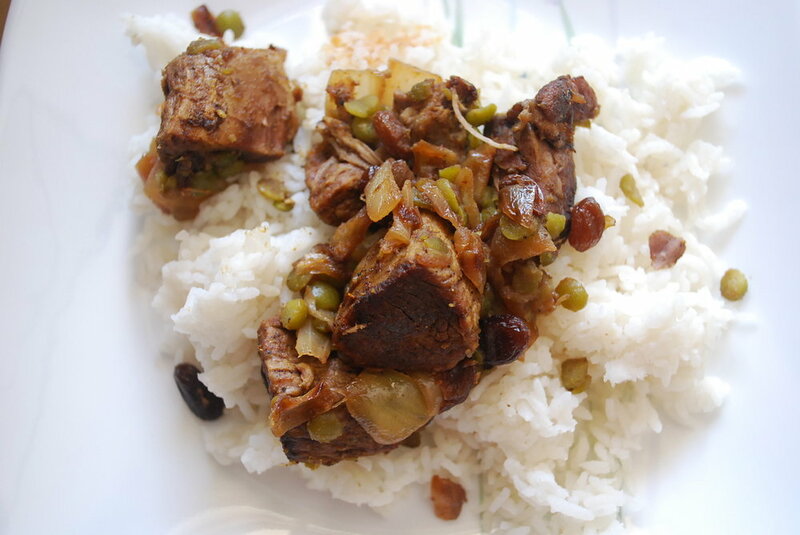 Machboos is a meat and rice dish, the rice is cooked in broth made from either chicken or lamb, which is then added back to the rice or cooked right back in the same pot. It can be amended with tomatoes, lentils, onions, and additional spices. This year we went even more traditional with this Lamb Machboos recipe. Last year we tried the chicken version, recipe is also below. Machboos is wonderfully fragrant. The flavors come together with a spice mixture called Baharat a combination of a lot of my favorites: cinnamon, clove, cardamom, nutmeg, and more. Make sure you have a few hours (maybe while the pre-race is on?) to let the flavors meld into the broth, you'll thank yourself for it when it all comes together. The rice is deceivingly simple, cooked in the lamb broth, it has an amazing flavor of it's own. 2. In a large pot, combine lamb cubes 8 cups water, all whole spices, salt and a quartered onion. 3. Bring to boil. Once water has come to boil remove the froth that floats on top with a spoon. Cover and let cook over medium-low for 90 minutes. Meanwhile, make the lentil mixture. 4. In a small saucepan put split peas, cover with water and add 1 tsp of salt. Over medium-high heat bring to boil. Cover, reduce heat to medium-low and cook for 20 minutes, until peas are tender. Drain and set aside. 5. Chop the remaining onions and sauté them in oil, until tender and golden brown. Reduce heat to medium-low. Add the cooked split peas and drained raisins. Add cinnamon, ground cloves, salt, sugar and black pepper. Continue to cook 1-2 minutes, until well combined. Take off heat and set aside. 6. After 90 minutes drain the lamb cubes in a colander that is set over a large bowl. Save the stock and discard the spices. 8. Wash and drain the rice several times, until water runs clear from the rice. Add rice to pot, pour enough meat stock to cover the rice by 2 cm. Bring to boil over high heat, cover and reduce to medium-low. Cook until rice absorbs all the liquid and is cooked and fluffy – about 15-20 minutes. 9.Mix all the ground spices. Rub the dry ingredients over the meat cubes. Arrange meat on an oven pan. 10. Mix 2 tbsp lemon juice, 1 tbsp oil and 2 tbsp of the meat stock. Drizzle over meat, cover pan with aluminum foil and enter oven for 10 minutes while the rice cooks. 11. When it is time to serve, fold meat with lentil and onion mixture and serve over rice.